As you know, here at Luxury Travel Diary I rather like the Four Seasons Hotels and Resort. Their new Private Jet experience is taking the Four Seasons experience to another level. Put simply, if you have the means you can now fully immersive Four Seasons Private Experience both in the air and on the ground – you never need to leave! The Four Seasons Private Jet is a Boeing 757-200ER leased by TCS World Travel (a luxury tour operator) from TAG Aviation (which provides pilots and maintenance) and operating under the Four Seasons brand complete with a slick paint job in metallic black. Inside the layout has been amended from 233 standard-size seats to 52 lie-flat seats, two on each side of the aisle. Each seat spans 6.5 feet, with decent aisle and legroom and is hand-crafted in white leather by specialised aerospace Italian designer Iacobucci. Tray tables are topped in dark shellacked wood, with a roomy surface that is large enough for a laptop or a formally set three-course meal. Flooring is a hand-woven woollen carpet and overhead bins are now double their original size but take up less headspace by tucking them deeper into the ceiling. The lighting is a forgiving and relaxing bi-color LED creating a calm ambiance, in shades of purple, white and soft blues. Ten Four Seasons trained in-flight crew, including an Executive Chef, a Sous Chef, a Four Seasons Concierge and a Global Guest Services Manager, are committed to making the journey truly personalised. 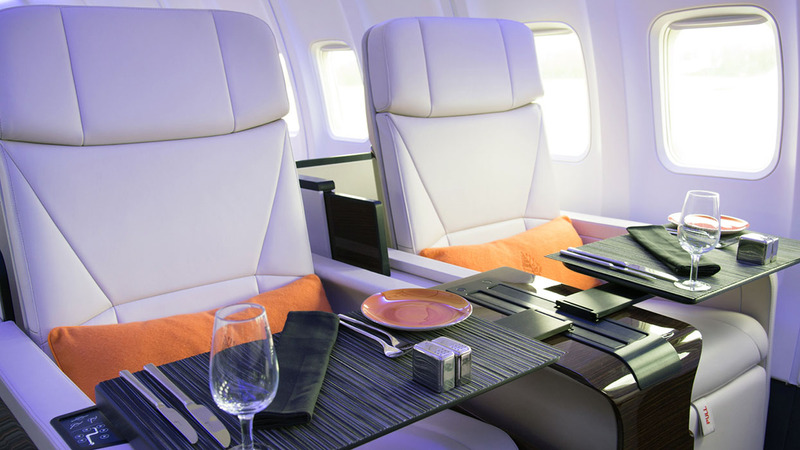 Even the dining experience has been taken to an entirely new level, with a quality of culinary excellence, presentation and service rarely enjoyed in the skies. Four Seasons chefs at the hotels provide local ingredients, which are cooked fresh in the air with an aviation-code steam oven. (Commercial jet-style convection ovens only reheat, leading to typically poor in-flight meals). Petrossian caviar and Champagne is also served at anytime on the Four Seasons jet. The innovative meals using fresh ingredients will be served on the finest tableware and linens, all with impeccable Four Seasons service. When you arrive at your seat, you will enjoy a rather nice array of goodies that Four Seasons gift to you and which are include a Bvlgari toiletry kit, cashmere blanket, Bose noise-canceling headphones, a custom-made leather travel journal by Moleskin with matching ballpoint pen. Each guest also receives an iPad Air 2 in advance of the trip, on which you can preload music and movies. You will also enjoy free Wi-Fi for fliers to visit websites and send e-mails. You can’t stream video content on board or you will mess up the connection, but they do supply a select library of both new and contemporary films and TV shows which are available to download. Why are these trips so special? If you are allergic to befriending staff, pilots and the passengers next to you on the flight, you are out of luck. These planes are designed to both provide the highest level or service whilst maintaining a fun and friendly environment and conversation is encouraged with staff, pilots and other guests. Itineraries are planned to avoid long hauls. On around-the-world tours, flight times range from 3.5 hours to 8 hours, with an average of 6 hours. Pilots also land in smaller civilian airports wherever possible. Bottom line, this plane is an uber luxury shuttle between Four Seasons resorts around the world. It takes all the hassle away from travel and prices include all accommodation, meals, drinks, ground transportation, and even custom excursions are inclusive. Similar excursions have been offered before (see my article on the “Year at Aman” experience where you simply hop around the world between Aman resorts) but never with a hotel branded jet and an in the skies hotel experience. The next Around the World Tour, scheduled in August which includes nine stops from Seattle to New York via Asia is already sold out. This 24-day itinerary comes in at $132,000 per person.